A landscape seen from Nasu by a master of Edo painting. This is a representative example of a shinkei-zu (real scenery, the Chinese character for shin being “real”) by Buncho Tani, a leading figure in Edo bunjin-ga (literati painting). Buncho accompanied Sadanobu Matsudaira (an important politician in the Edo period) when he took over the Shirakawa clan and must have seen views of Shimotsuke (the old name of Tochigi Prefecture) many times while coming and going between Shirakawa and Edo. 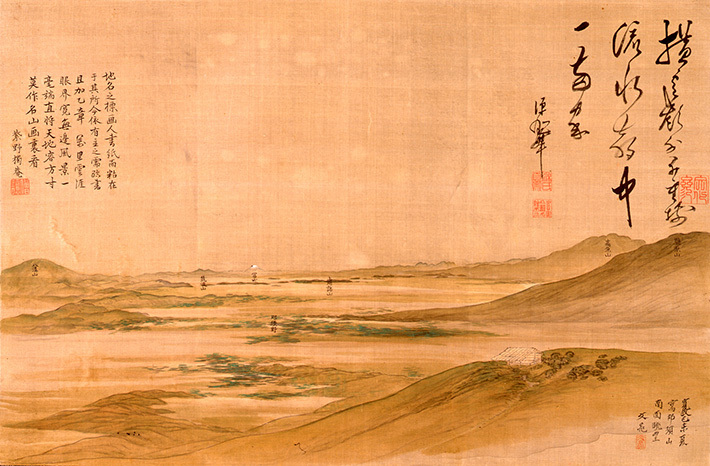 The inscription on the upper right, which is a homage to Sadanobu, includes the words “south side of the Nasu Mountains,” indicating that this painting is based on a view from one of the Nasu Mountains. Far beyond the planar Nasunogahara, there is a snow-capped Mount Fuji with Mount Tsukuba to its left. On the right, the mountains are marked as those of Joshu, but this seems different from the actual view. The scenery is probably reconstructed according to the artist’s sense of the actual view with Mount Fuji at the center and the mountains in the northern Kanto area placed around it. The building in the front right seems to be a spa, which may have had something to do with Sadanobu. Japanese shinkei-zu is persistently bunjin-ga, and could also be regarded as shinkei-zu (psychological scenery, the Chinese character for shin being “mind”) also comprising the artist’s human relationships.